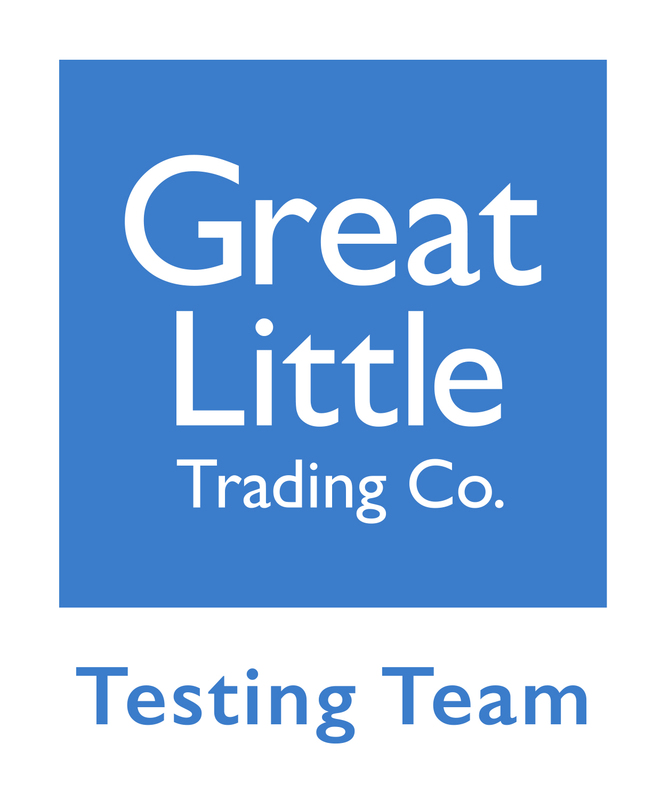 The little ladies really enjoy books. They are something which we have integrated into their day since they were babies. I think reading with your children and getting them to engage with books and use their imagination is really important. The girls each choose a bedtime story each night and we also read to them in the day as and when they bring us books or for a bit of quiet time. We also visit the library once a fortnight and come home with far more books than I can carry. I love their passion for books though and have been looking for ways to encourage their love of books further. 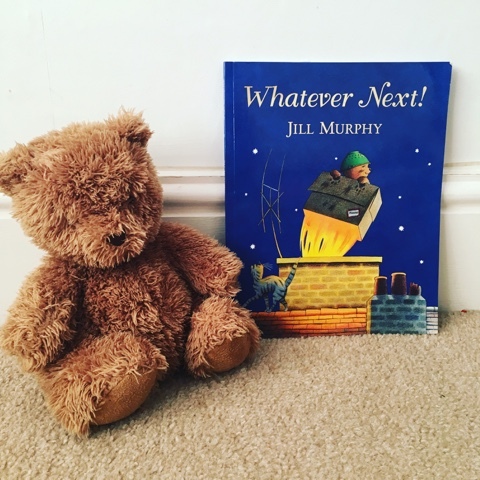 I thought I'd share how we have been getting creative with our storytelling with one of our favourite books, 'Whatever Next' by Jill Murphy. Whatever Next is a timeless classic and one I enjoyed as a child also. 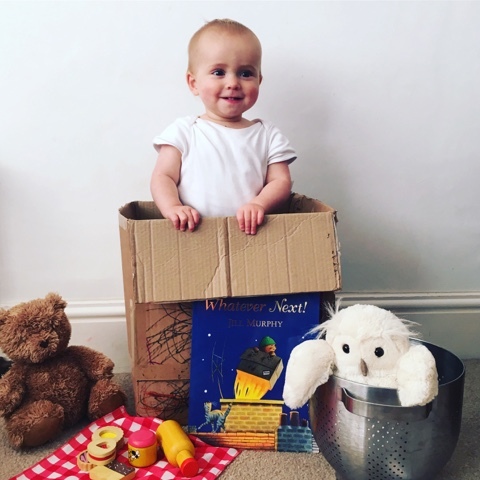 It's the perfect book to get creative with to encourage your child to engage in the story. 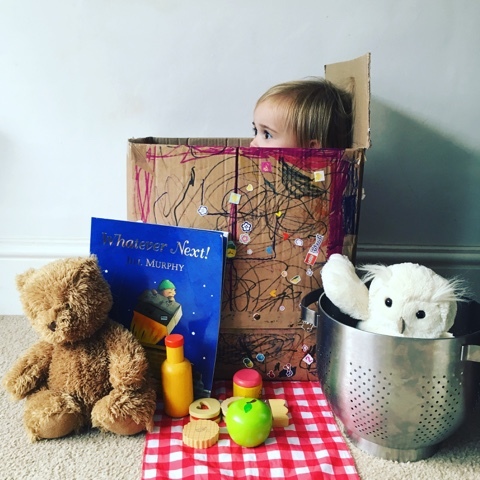 If you haven't read 'Whatever Next' it's the story of a young bear who takes a trip to the moon using a card box box for a rocket just before bath time. 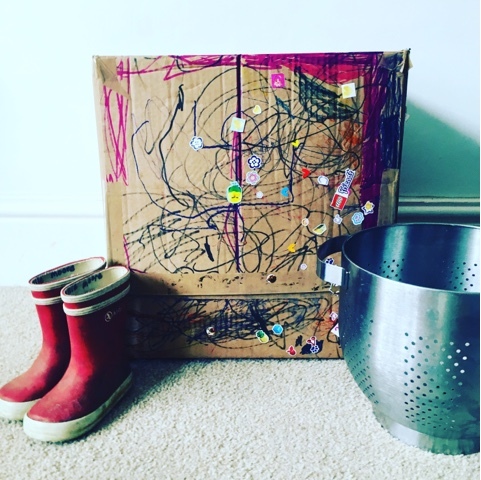 Next Phoebe found her 'space boots' (wellies) and we looked in the kitchen together for a 'space helmet' (colander). We then found a cuddly owl, a friend that baby bear meets on this travels, but you could draw and colour one in if you don't have one. 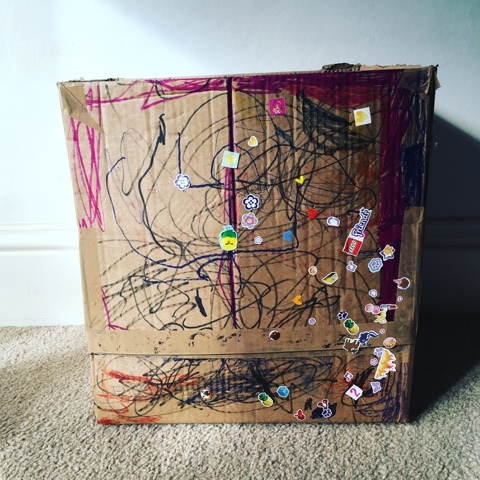 Creative storytelling is all about using things that you have or making things to tell the story with so there is plenty of room for creative licence as long as it makes sense and helps your child understand the story. We raided the play kitchen for picnic food but you could use real food if you wanted too and have an actual moon picnic. 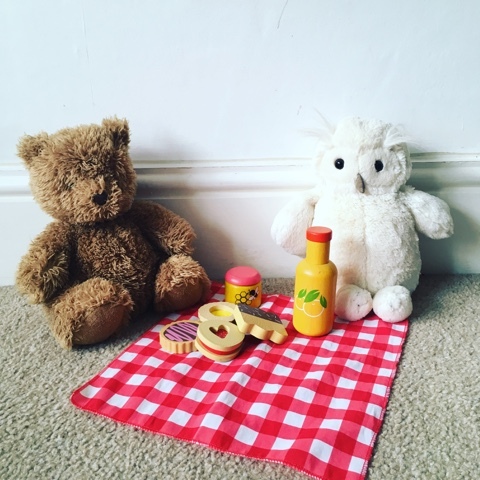 Once we had everything ready we then sat and told the story together, I encouraged Phoebe to find the relevant props as I read the words. As soon as we reached the end she wanted to do it again. She can now proudly re tell the story with these props and frequently chooses the book from the reading corner. Lottie was keen to get involved too and found the whole thing very exciting, in fact she hardly got out of the box! It was a really lovely activity to share together and really very simple. You can do this activity with any book. 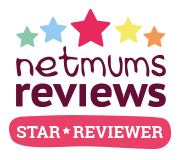 I'd love to hear which books are your little one's favourites or which ones you'd like to try and creatively tell. We're going to try 'The Tiger That Came To Tea' and 'The Very Hungry Caterpillar' next. If you like this idea why not pin it to Pinterest for later?